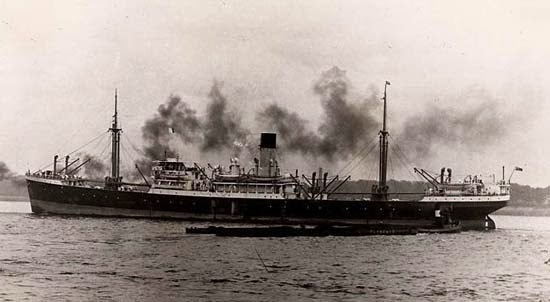 The British motor ship Peisander, which was on a voyage from New South Wales, Australia (left 15thMarch 1942) to Liverpool via Panama when she was torpedoed and sunk by U-653 under Gerhard Feiler on the 17th of May. Note the life boats along the funnel and between the funnel and the bridge – the ship was originally fitted with eight boats to carry Chinese passengers. The British motor ship Peisander was completed in April 1925 by Caledon Shipbuilding and Engineering company Limited in Dundee, Scotland as hull number 287. Weighing 6,225 gross tons she was 432 feet long and 54.5 feet wide. 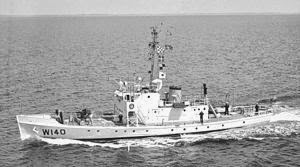 Twin diesel engines propelled the ship at 13.5 knots when built. In 1942 the ship was owned by Alfred Holt and Company, which was known as the Blue Funnel Line, or Ocean Steamship Company, of Liverpool. She appears to have traded mostly in the Far East and Pacific at the outset of World War II. On 20 December 1937 the “Singapore Free Press and Mercantile Advertiser” promoted Peisander’s line from there to New York via Cape of Good Hope, leaving January 8th, 1938. 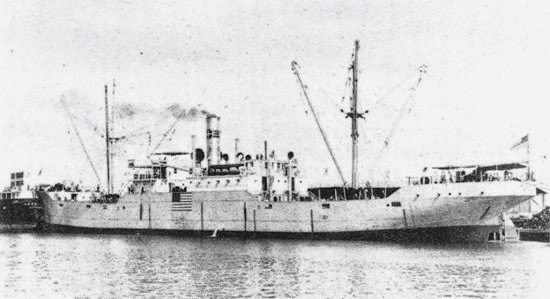 On January 31 1942 the British Admiralty noted that Peisander was not in Convoy M.S.1 which arrived in Singapore the day before. On her final voyage the Peisander departed Newcastle, New South Wales, Australia, on the 15th of March 1942. 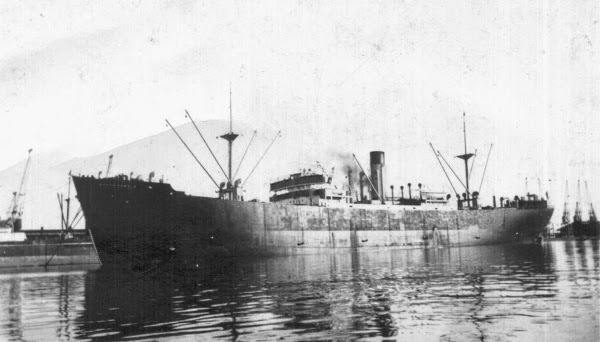 Her cargo consisted of 6,590 tons of wheat and 97 tons of wool and 20 tons of tungsten ore. Her destination was her home port of Liverpool, via the Panama Canal. In Panama the ship loaded Consular mail for London and other bags of ordinary General Post Office mails. On Wednesday the 13th of May 1942 the US Navy destroyer USS Davis (DD 395) came upon the Peisander north of Puerto Rico. The interaction occurred at 9:49 am local time and began 12 miles apart. The navy men went to battle stations until they could verify that the Peisander was an Ally going about her business of supplying the UK in its time of need. The position was 20,39.3N by 67,20.5W, or 125 north-northwest of San Juan. After that the Peisander men did not sight any other ships, however several Allied aircraft became visible during their voyage. Peisander was manned by Captain Angus Shaw who was responsible in turn for 64 other persons. Three of them were gunners and four were passengers, meaning that a total of 57 were merchant mariners, including Shaw. The First Mate or Chief Officer was F. C. Brown of Smiths Cottage, Latham, Lancashire. The Second Mate was W. Thomas of 19 Kenilworth Road, Childwell, Liverpool, and the Third Mate was I. H. Browning of 6 Cromer Road, Weston, Super Mare, Somersetshire. The ship was armed with a four-inch gun, two Lewis machine guns, two Hotchkiss machine guns, three depth-charges, four P.A.C.s, and kites. At mid-day of Sunday May 17th1942 the Peisander was 300 miles north of Bermuda and 300 miles southeast of Nantucket, equidistant between both points of land. Captain Shaw had obeyed his Admiralty routing instructions by passing through the Mona Passage separating Hispaniola and Puerto Rico, and then at least 25 miles east of Bermuda. The ship was zig zagging continuously during the day, varying the patterns between British directives numbered 11, 38, and 12. Captain Shaw was just enjoying a mid-day lunch down below before 1 pm, and the ship was executing pattern 11 zig zags. There were two lookouts on the bridge, another aft by the gun and a fourth in the crow’s nest up forward. Shaw described the weather as “fine and clear, the sea was moderately rough with a heavy swell, and there was a south-easterly wind…” about 20 knots. Unbeknownst to Shaw, the German submarine U-653 has been following his ship for several hours, thrown off by the constant zig zagging, but not entirely deterred. U-653’s commander, Kapitänleutnant Gerhard Feiler was 32 at the time, having been born in Breslau in 1909. A member of the Crew of 1934, he served on the destroyer Karl Galster between 1938 and 1940 before joining U-boats in July of that year. He commanded U-653 between 1941 and 1943. According to Feiler’s attack report, he first sighted the Peisander at 4:20 pm German time, which was 10:20 am local time, or aboard the ship. The ship was zig zagging so often that Feiler had a difficult time lining up a reliable shot. He was able to observe that the ship was armed with a gun, anti-aircraft weaponry and was painted dark grey. He estimated her tonnage at 4,500 gross tons. At 1:01 pm ship’s time Feiler fired two torpedoes. The first was observed by Able-Bodied Seaman W. M. Galor of 7 Kidman Terrace, London, who was positioned in the crow’s nest. It passed some five yards ahead of the ship, but before an alarm could be sounded or anything done about it, the second torpedo struck the starboard side, after a 59-second run. According to Feiler this resulted in a large water column erupting on the side of the ship. He noticed that at least at first the crew remained on board, and because of the guns he remained submerged. The damage reports reaching Shaw were quite dire: the wireless apparatus was a tangled mess, meaning no SSS message could be sent. The engine room was flooded to the platform plates, probably because the engine room lights had been stove in by the explosion. Cargo holds # 2 and # 3 up forward were flooded. Peisander was listing 5-10 degrees to starboard. The engines stopped and the ship was losing headway. Captain Shaw decided to order abandon ship, and turned the wheel hard to port in order to do so. Three lifeboats on the port side were undamaged, as was one of them on the starboard side – the only one which was swung inboard. In fact the Peisander was originally equipped with eight lifeboats of capacity 400 people, in order to carry Chinese passengers. By shortly after 1:00 pm local time (Shaw estimates the ship was originally hit at 12:45 pm), he had destroyed the secret code books, thrown the ship’s log and some navigational equipment into a suitcase and into one of the boats, and all three boats had cast off with 61 persons total in them. They rowed 200 yards and waited to see what would happen next. Then, 27 minutes after the first attack, at 1:28 pm Feiler fired a single G7e high-precision torpedo at the ship. Sixty-seven seconds later this projectile found its mark. The submarine commander recorded hearing six explosions after seeing another high water column. He opined that the residual explosions were boilers, and watched the ship slowly sink after about 16 minutes, or at 1:44 pm local time. Feiler complained that he could never read the name of the ship on the hull, and since no SSSS message had been sent he never did learn his victim’s name. Why the submariners never approached the lifeboats for this information is not known, however Feiler seems particularly cautious. Also, two and three-quarter hours later he was in hot pursuit of another ship. From his new vantage point Shaw was able to observe a hole in the starboard side of his ship between the 2nd and 3rdcargo holds that was 10 feet wide and 20 feet above the water line. He observed that as the men were watching, “suddenly the ship straightened up and appeared as if she would remain afloat.” They were just going to row back to her in order to retrieve warm clothes and a chronometer hen a second torpedo struck, also in the starboard side, but this time in the engine room. Shaw said it took only five minutes (compared with Feiler’s 16 minutes) for the Peisander to sink by the bow. There were two life-boats on the poop deck which floated away from the hull as she sank. Shaw saw the conning tower of an enemy submarine break water, but only for a few minutes before submerging. According to a crew member, the periscope followed the boats for up to an hour. Captain Shaw’s boat held 18 men and the other two boats 23 and 20 men respectively. They all assembled and agreed to sail west in order to counter the easterly effects of the Gulf Stream currents. They ultimately would make for Nantucket, roughly 300 miles to the northwest. The 35 gallons of fresh water was rationed to about three ounces per day per man. For food there was pemmican, Horlick’s milk tablets, raisins, peanuts, and prunes as well as chocolate and biscuits. At 2 pm they raised sail. By 4 pm, assuming the submarine had left them, they set up the emergency wireless radio set. At 11 pm there was a heavy rain squall and Captain Shaw’s boat was separated from the two other boats, which were under the command of First Mate Thomas and Second Engineer H. W. Wilson of 69 Melwood Drive, Liverpool. On Monday the 18th of May the rain continued and the men were wet and unhappy. Captain Shaw had a change of clothes and warm layers, but most of the men did not. When the rain stopped and the sun came out they were more cheerful. Shaw devised a makeshift platform in the boat for the men to take turns lying on, in order to enable them to sleep. The next day, Tuesday the 19ththe wind died and Captain Shaw took a dip in the sea, followed by some of the crew. The wind filled in during the evening. On Wednesday the 20ththe wind lightened but the still made headway towards land. That night, at 9 pm they were able to obtain a time signal via wireless radio, which vastly assisted Shaw’s navigation. After dawn on Thursday the 21stof May, their fourth day in the boats, the men sighted the 3,282-ton American steamer Plow City. The ship was en route from Port of Spain Trinidad to New York with 4,971 tons of bauxite ore. At 7:30 am the ship was four miles away, but the Peisander men were able to row two miles towards it. They tried to transmit a Mayday message by the small wireless set, but it was not received. Half an hour later the lifeboat and ship were only two miles apart when suddenly the Plow City changed course away from the boat and sent a “SSS” or submarine sighted message along with their position. Captain Shaw was able to record his position and verify his navigation. The Plow City was sunk at 2 pm that day by U-588 under Kapitänleutnant Victor Vogel. Using the Plow City’s position, Shaw determined that they were 220 nautical miles west-northwest of where the Peisander sank, and 140 nautical miles south of Nantucket. Given the dangers of the notorious Nantucket shoals, he opted to navigate towards Cape Cod instead. The night of the 20th and the morning of Friday the 21st of May they again broadcast their position with no reply. The weather became very rough and they were forced to ride out the gale with a sea anchor. Sunday the 24th of May at 9 am the men in the boat saw and heard breakers on the port bow, to the northwest. Deducing correctly that they had drifted south onto Nantucket Shoals – infamously dangerous – Captain Shaw shaped a course to the northeast for eight miles. At 5 pm that day two planes saw them and circled around the lifeboat. The fog set in thickly then darkness enveloped them, so Shaw decided to anchor and await rescue. At daylight on Monday the 25thof May the planes returned and advised the Peisander men to remain anchored. They also dropped supplies in two packets, which were retrieved. They contained First Aid supplies, eight cans of tomato juice which were very popular, American pemmican which was vastly preferred over the British variety, and chocolate. By now liquids were all that the Second Steward could swallow, his teeth had become so painfully bad. The Eastern Sea Frontier Enemy Action and Distress Diary records that at 9:55 am, when 32 nautical miles east of Nantucket the General Greene sighted the submarine. At 10:13 am she reported herself as “engaging sub.” Three depth charges were dropped, but two did not explode initially. After one exploded it is believed however to have set off another of the depth charges. The report concludes that “Oil came to the surface, and a sub may have been sunk.” There is no corroborating report of a German U-boat being in those relatively shallow waters at that time. The US Coast Guard Cutter General Greene (WPC 140), was named after a Revolutionary War hero. It served from 1927 to 1968. She rescued the first lifeboat of Peisander off Nantucket and towed their lifeboat to Newport, Rhode Island, a major US Navy base at the time. The steam ship Baron Semple at Newport, Wales, on the 1st of September 1939, days before World War II broke out. This ship stopped to rescued men from two boats from the Peisander, however as the ship was sailing for South Africa, its services were politely turned down. On Wednesday the 20thof May the 4.573-ton British steam ship Baron Semple came across two of the Peisander’s lifeboats and offered to take the men aboard, even though it would have been a challenge to feed, house and clothe the 43 men. The Baron Semple was built in 1939 by C. Connell and Company Limited of Glasgow. Her skipper was Captain Philip Jarvis Carnie. The vessel’s owners were H. Hogarth and Sons, Limited, also of Glasgow. After giving the offer some thought the Peisander men weighed the fact that “the survivors were fit and well and the weather was very good and the possibility of being seen very soon. They told Baron Semple – “Thank you, but we stay where we are” (Mayes). It was, according to Stilgoe, “…a decision which surprised everyone aboard the steamship.” (p.217, “Lifeboat”). The First Naval District noted that Nantucket Coast Guard reported the arrival first of a lifeboat with 28 men in it, “mostly Chinese,” from the Peisander had landed on that island. The life boat was described as being 45 feet, which seems extraordinarily long, (but might explain why it was later towed to Newport Rhode Island some 70 miles away). The Nantucket station said that airplanes had made contact with another lifeboat off Nantucket at 5:50 am on Monday the 25th of May. At 7:10 pm two other boats were observed 30 nautical miles east of Nantucket, presumably by airplanes as well. 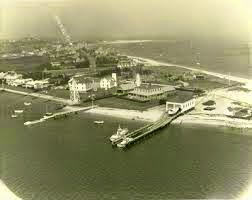 The US Coast Guard station at Brant Point, Nantucket Harbor, c.1968. This is where all 61 men from Peisander’s three boats were assembled by three Nantucket rescue vessels before they were towed to Newport Rhode Island on the 26th of May 1942. The General Greene was a 125-foot patrol boat built by the American Brown Boveri Electric Corporation of Camden, New Jersey in 1927. She was 23.5 feet wide and 7.5 feet deep with twin engines giving her 13 knots. Once she had taken the Captain’s boat ashore in Nantucket it hitched together all three boats and towed them to Newport, Rhode Island, roughly 70 nautical miles to the west, where she arrived in the afternoon of Tuesday May 26th. Moving northeast Feiler in U-653 was able to refuel from U-459 about 500 miles northeast of Bermuda before returning to Brest, where it was based with the 1st U-boat Flotilla. The patrol had begun on the 25th of April and ended on the sixth of July, 1942. Over seven patrols in the same sub for 412 patrol days he managed to attack five ships worth 9,382 tons – less than stellar results when compared with his colleagues in the same timeframe (December 1941 – September 1943). He was awarded the German Cross in Gold in 1944. Gerhard Feiler lived until 1990. Mayes, Stanley, blog post at www.shipsnostalgia.com/archive/index.php?t-29448.html. The National Archives, UK, Kew Gardens – for the official narrative of the loss by British officers, kept in Admiralty archives there.